Hi everyone! Helen is here today would like to share with you a quick and fun way creating more than 1 cards with just 1 stamp & cut die set. 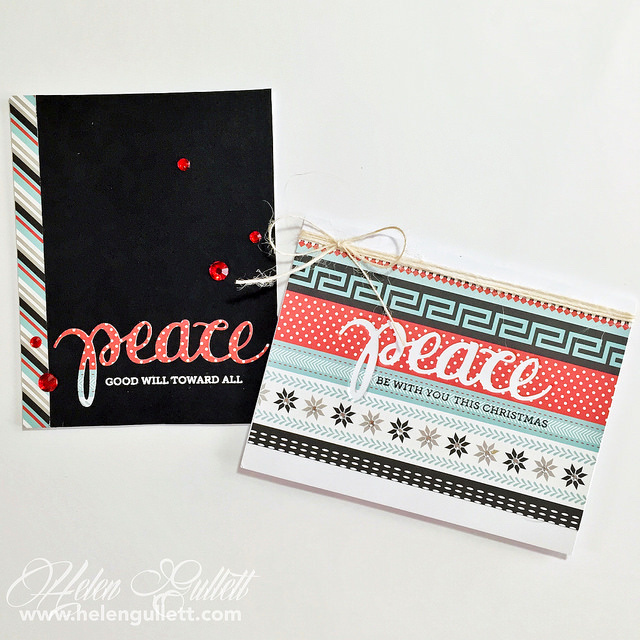 On my cards today, I used the Hero Arts – Peace Stamp & Cut Die set. I used A2 white cards for the base. First I cut out a piece of patterned paper that will fit on 1 card. I added the die at one the patterned paper where I wanted it to be on this card, then run it through my die cutting machine. With this technique, I had a positive die cut and negative die cut from that patterned paper. Next step is to create the card using the positive and negative die cuts. I often go with clean-and-simple when it comes to mass-producing cards. So after I added the die cuts, stamping and embossing the sentiments, I simply added some embellishments on the cards. You can use any gems an/or twines on cards to embellish them. During this season, I am making lots of Holiday cards for friends and families. And for me, I make batch of cards from 1 stamp set, or/and with matching die cut set. One of my favorite sets are Hero Arts Stamp & Cut Die sets. They are sets that including stamps and matching dies. You find them here at the a2z Store. And get 15% OFF for your order of $25 or more by adding this code Helen15 when you checkout. If you do not see any Hero Arts products that you’d like to buy, you can custom order it through a2z Store! Our November Challenge is all about Embellishments, so I hope these cards today can be an inspiration for you to create projects and link up at our challenge. 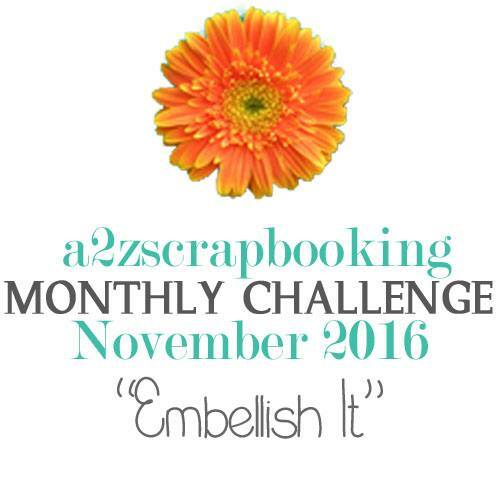 By linking up, you can win a $25 gift card to the a2z Store. Categories: Christmas, Clean and Simple, Embossing, Handmade Cards, Hero Arts | Tags: card, CAS, Christmas, Christmas Card, clean and simple, die cuts, Heat Embossing, Hero Arts, stamping | Permalink. Nicely done!!! Love the non-traditional colors and how you used the positive and negative die cut in these cards! !